7 1/4 inches long total. 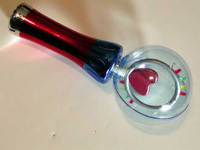 Handle is 4 1/4 inches long with silver, red, and blue metallic colors. Push button activation located on handle. Must keep depressed for light and motion. 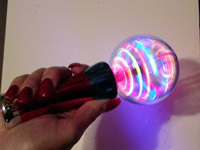 Plastic globe is 2 3/4 inches in diameter. Requires 3 AAA batteries which are included. The two pics show the item off (left) and on (right). $3.35 each for 48 or more. $2.90 each for 96 or more.